Diving Beqa Lagoon (Pronounced Benga) was absolutely fantastic. I have never seen so many sharks before on a single dive. 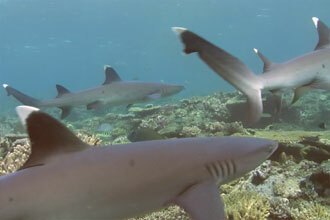 The sharks just swim gracefully around you as if you are not even there munching and crunching on their food. This video is of our safety stop coming up from 30m after seeing the bigger sharks, here you can see Black and White Tip sharks swimming around. Even though they are small I got to realise the power these fish have when @3:08 a sharks fin flipped by my face and the water pressure knocked my mask. Great video, looks like a really amazing up and close experience! It was amazing, it felt like I was in a giant fish tank. I still have a few hours worth of footage to go through of the Bull sharks. Really want to get a video up of them just haven’t had the time yet. Nice Video and this good experience to see this.